1) Choose a shipping option so you have to sign for delivery (and tell friends and relatives who may be shipping you packages to do the same). If you can specify that only the person whose name is on the package sign for it, make that happen. 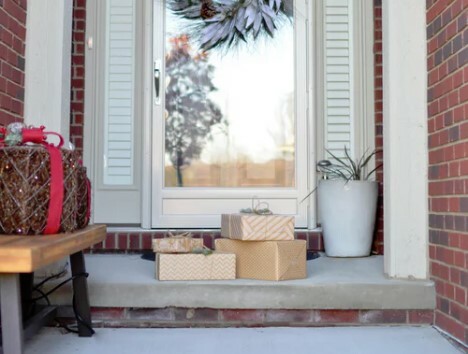 2) Keep an eye on the package's delivery status so you know when to expect it (then you can either be home or leave a note for the delivery person to deliver it to a neighbor). If friends/relatives are sending something, ask them to send you the tracking number. 3) Get to know your carriers. Typically they have the same person on 'your route'. Introduce yourself and get to know them where possible. Having a connection to who is delivering your packages will help get better service. If there has been a problem with stolen packages in your neighborhood, tell them about it. 5) Leave special instructions where to deliver packages if you are not going to be home.
" "One of my friends is a FedEx driver and she recommends using the 2nd address line to list where you might like the driver to hide your package (though, she is delivering in more of a suburban area)." 7) Choose "delivery pick up" so they hold your package rather than leave it on your vacant doorstep or in your open vestibule. 8) If you live in a building, set up a way to have neighbors hold each others' packages rather than leave them in a common area. 9) Insure your packages, just to be safe. "My family has an account at a package handling store like the UPS Store, where you can get either a “mailbox” or a fee per delivery (I think we paid $100 up front for 30 delivery “coupons”) and then have packages delivered to your name there. It’s per name, so we used my husband’s and I have to order things in his name. We used that regularly at one point after a rash of package thefts on our block, but have gone back to getting packages delivered to our house – with a few exceptions such obvious electronics packages, which we sent to the UPS Store since they’re so tempting for theft - and had no trouble for the past year or so. Our mailbox is by a basement door four steps down, which helps (and if you have double doors around a vestibule, you can leave the outside one unlocked, which again provides some concealment). There’s a UPS Store on Seventh Ave near 8th St, and one on Flatbush if you’re in the North Slope. You also can get a box at the regular post office on a monthly/yearly basis. But large packages you would have to pick up at their window, which tends to be more crowded and is open fewer hours than the UPS Store. Either way, of course, you have to carry them home." 11) Sign up for the free service like "UPS My Service"
"I signed up for UPS My Choice (it's free) and have been loving it. It will email you a window of when your package will arrive and also a confirmation that it's been delivered. I believe you can also ask them to change the window for delivery, though I haven't done that yet. It saved me once because I was inside my apartment and saw the email that the package had been delivered but I never heard a buzz or anything. Turns out our UPS delivery person had accidentally left it at the wrong building (a few doors down) so I was able to find him on our block since he was still around and sort it out!" What happens when your package IS stolen? - If a package IS stolen, call your precinct and report the theft, the business you ordered from, and your credit card company (to find out if it offers purchase-protection for reimbursements). - NYPD dollars are allocated depending on the level of crime in a neighborhood so if these "smaller" crimes go unreported the trickledown effect is that there may be fewer and fewer officers 'present' in the neighborhood to help deter these kinds of crimes. There are plain clothes officers in our neighborhood, and more of them if the city knows of more crimes. NOTE: USPS (a governmental agency) thefts are handled differently than UPS (a private, not federal entity), and the NYPD can refer you to the appropriate place and log the crime.